Copyright education is a contested field characterised by disagreements about definitions and aims. The present report seeks to identify and map current debates about copyright education by surveying relevant literature. The paper identifies 10 distinct categories of copyright education discussed in research and scholarship about copyright. These categories include consumer education initiatives in the tradition of public warnings against criminal behaviour ‘You wouldn’t steal a handbag…’, studies of use of media materials by educators in classrooms, and debates about open access to knowledge in higher education. The paper closes with a discussion of the findings and recommendations for future research about copyright education. 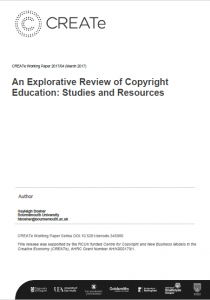 Download An Explorative Review of Copyright Education: Studies and Resources.